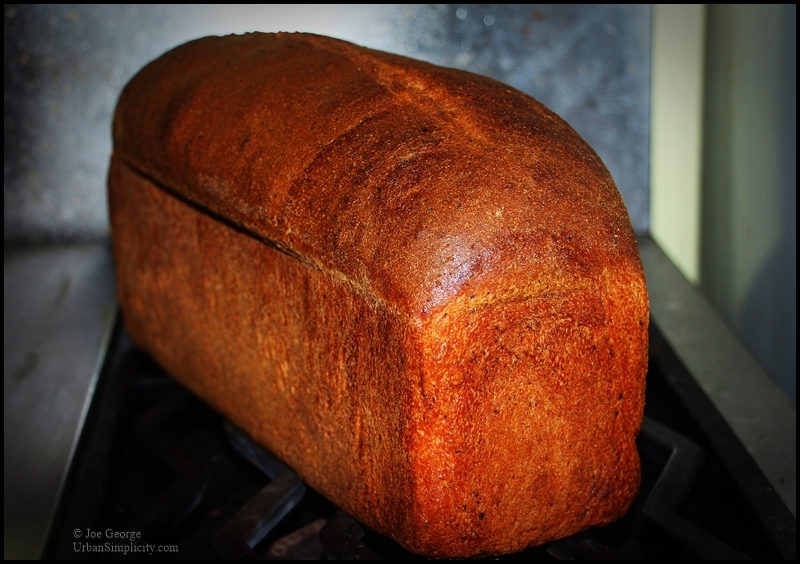 I made this bread the other day; about 4 days ago, actually. I've made it before, but I often try to improve recipes. And I'm often trying to make bread healthier as well. This is a classic whole wheat bread with the addition of rolled oats and flax, both of which can absorb a lot of liquid, this is the reason the high ratio of liquid-to-flour (whole wheat flour absorbs more liquid than refined flour as well). 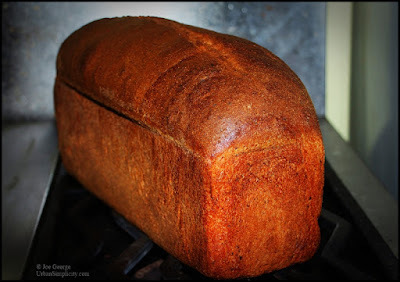 Anyhow, this is a relatively simple to make bread recipe; it's pretty straight-forward. 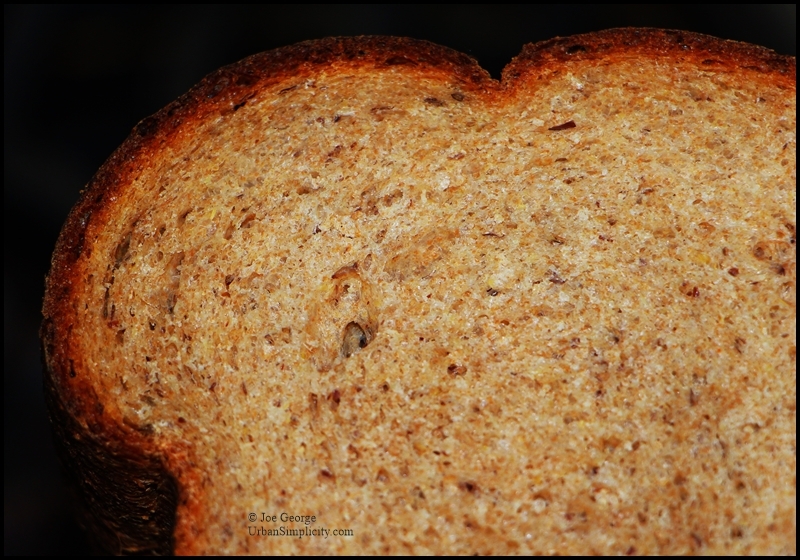 And not only is it nutritious, it is also a bread with a lot of character; really delicious. This will make two or three average sized loaves, but I made it into one giant Pullman-style loaf. I've been eating it for the past four days. Separate the ingredients into two bowls using this ratio: In one bowl combine 4 cups of flour, two cups of oatmeal, the flax seed, wheat gluten, and 3 cups of water; stir until just combined. In the second bowl combine the remaining 2 cups of flour, 1 tablespoon of yeast, and 1 cup of water; stir until just combined. Cover the bowls and allow the ingredients to rest and begin fermenting for at least an hour, but up to 12. Then combine the contents of bowl bowls into the bowl of an upright mixer fitted with a dough hook. Add the remaining tablespoon of yeast, along with the olive oil, honey, and salt. Knead the dough on medium speed for about 8 minutes, then cover and allow to rise for one hour (if the dough is too moist you may need to add additional flour; this will depend on how much liquid the oats absorbs). 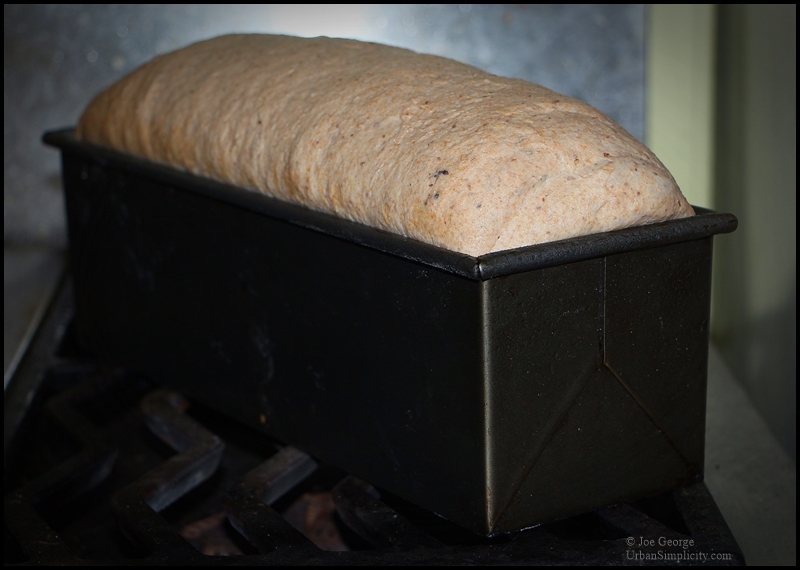 Transfer the dough to a work surface, cut it into two or pieces, gently shape it into loaves. Dust the counter with extra oatmeal and roll the loaves in it, gently pressing oatmeal into the surface of the raw dough. Place the loaves into oiled loaf pans, cover with plastic wrap, and allow to rise for 45 minutes. Preheat an oven to 425F. Bake the bread for about 30 minutes, or until golden brown and sounds hollow when tapped on. Remove the bread from their pans and allow to cool for 10 minutes before slicing.